The Witty Ways of a Wayward Woman: Is Bjork Bonkers? Let's take bets. I'm only giving evens. It's time for another of my Christmas Musical countdowns which, you may have guessed, is Bjork. So here she is singing Crystallline on the Jools Holland show back in November. I was fascinated by her performance - and the song has quite an addictive equality to it as well. A pretty good song there me thinks. Strangely addictive. Bjork is defintely an original artist. But I have to ask - what the hell was going on with the 1980s' disco culottes and the platform boots? And that hair? She looks like she had an accident with some candy floss and a bucket of sick. And what is this current craze with false eyelashes about? Apparently sales of false eyelashes have rocketed recently. To be honest, I think when you're eyes are so loaded up with mascara and lashes like Bjork it just looks like you've got two dead blowflies on your face or you've done a couple of rounds with Mike Tyson. I tried putting some on the other day and when I stepped back from the mirror I thought I looked like a zombified Zsa Zsa Gabor. Cripes - I just looked up Bjork's wikipedia entry. We're the same age. There for the grace of God, go I. Anyway, talking of Bjork. I read this book earlier in the year. In fact, it might even have been last year. 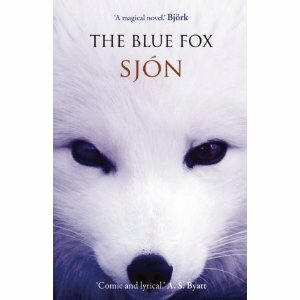 The Blue Fox is written by a chap called Sjon, who also happens to write lyrics for Bjork. The novel is short and sweet and, like Bjork, strangely compelling. It's a fairytale about a fox and rather good it is too. Well that's probably putting it too simply but it is well worth the read. I got my copy from the local library as at the cost of 7.99 (at the time I considered purchasing it) I felt slightly annoyed as it is a mere 112 pages. I do wish these publishers would stop trying to screw us - especially with ebooks. I am, quite simply, not going to pay the same price for an ebook as for a paperback and no argument is going to convince me that I should! Right, I'm going to go and get my boot polish out and scare the neighbours. I might even dust the windowsills first and see if I can find some blowflies. I don't have a Kindle or similar. But apparently, while the 'conventional' book is zero rated for VAT, e-books aren't. So I guess that explains why the price are similar. Good point indeed Martin - and that obviously explains some of the difference. There are huge discrepancies though - take for example- in April this year I downloaded a sample of The Finkler Question on my Kindle and was enjoying it so much (I know strange!) and decided to purchase it without checking the paperback price - I was charged 7.40. A couple of days later I noticed the paperback price was about 4.00!!! The cost of The Finkler Question is currently 4.55 on Amazon for paperback and 4.32 on Kindle which is a far more realistic pricing. However, even with 20% VAT I still can't see when you factor out the cost of manufacturing and production how they can justify that sort of cost. The cynic in me says greed is a motivating factor - and still the author gets peanuts.